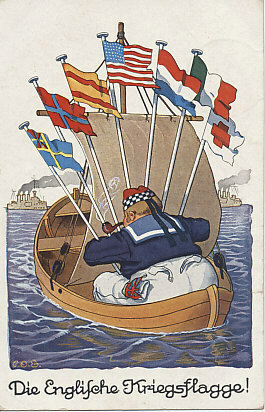 A heavyset English sailor flies a panoply of flags of neutral nations including Sweden (civil ensign), Norway, Spanish Merchant Marine, the United States, Netherlands, Italy, and the Red Cross. Germany accused Great Britain of flying false flags on merchant and passenger ships, and of arming them. 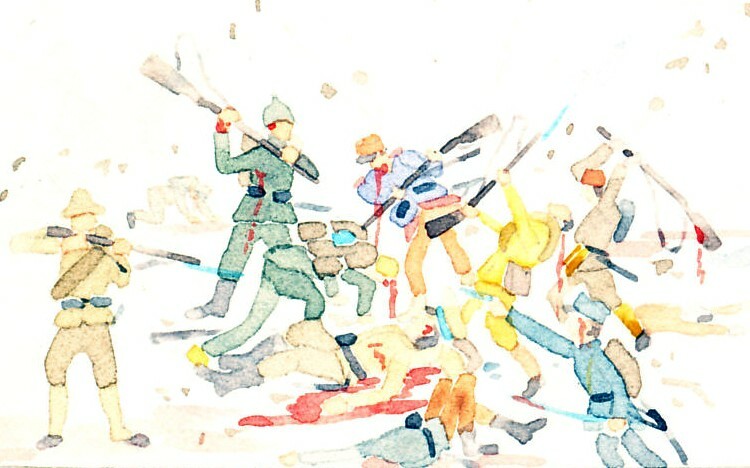 A postcard by P.O.Engelhard (P.O.E. 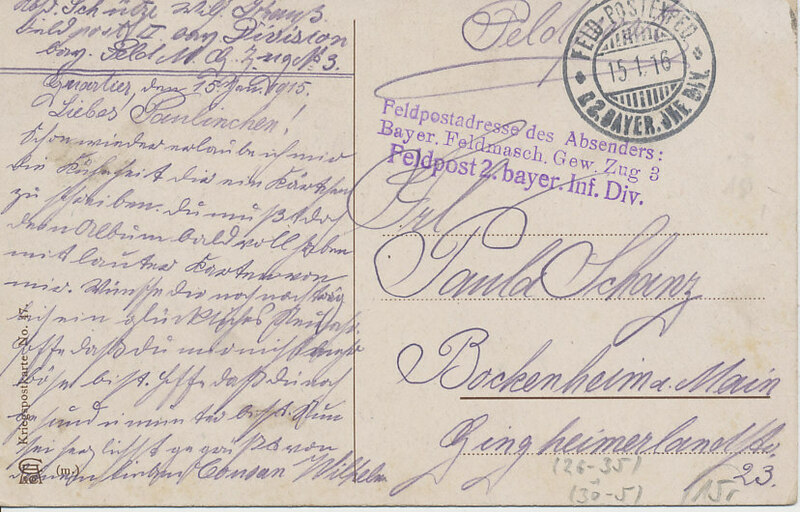 ), dated and postmarked January 15, 1916. "The spiralling violence of the war at sea aroused bitter hatred on both sides of the North Sea. On 23 December 1915 Britain issued the Trading with the Enemy Act which established a 'statutory black list' of firms — friendly or neutral — that traded with the Central Powers. Germany responded on 12 February 1916 with its second U-boat offensive against shipping bound for the British Isles. Once more, German U-boat captains reported difficulties in distinguishing between neutrals and belligerents. They also reported that British ships used neutral flags to confound them and armed decoy (Q) ships to trap them." German submarines began sinking shipping around the British Isles in 1914. Great Britain declared the entire North Sea a military zone effective November 5, and imposed a blockade of Germany. On February 4, 1915, Germany announced a campaign of unrestricted submarine warfare in which all ships of Britain and its allies were subject to sinking without notice. It became effective on February 18. Germany accused Britain of false-flagging its merchant ships, sailing them under the flags of neutral nations. Britain both armed merchant ships, and used decoy merchant ships, the armed Q ships, to lure submarines before opening fire on them. On May 7, 1915, German submarine U-20 sank the passenger liner Lusitania, killing 1,195 civilians, 128 of them Americans. Responding to American protests, Germany restricted, but did not end, its campaign at the end of August.